As seen in Corporate Board Member First Quarter 2018 - Compensation is always tricky, but it’s even tougher in an up-and-down business, where markets—as much as the managers—run the show. Jim Wolf, managing partner at Meridian Compensation Partners, offers advice on getting it right. 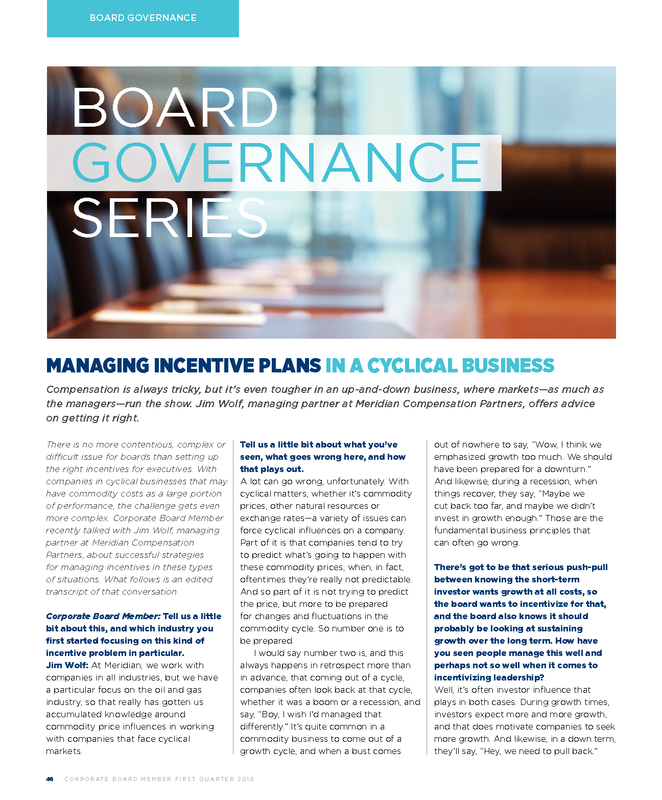 There is no more contentious, complex or difficult issue for boards than setting up the right incentives for executives. With companies in cyclical businesses that may have commodity costs as a large portion of performance, the challenge gets even more complex. 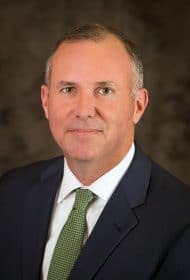 Corporate Board Member recently talked with Jim Wolf, managing partner at Meridian Compensation Partners, about successful strategies for managing incentives in these types of situations. What follows is an edited transcript of that conversation. Corporate Board Member: Tell us a little bit about this, and which industry you first started focusing on this kind of incentive problem in particular. Jim Wolf: At Meridian, we work with companies in all industries, but we have a particular focus on the oil and gas industry, so that really has gotten us accumulated knowledge around commodity price influences in working with companies that face cyclical markets. Tell us a little bit about what you’ve seen, what goes wrong here, and how that plays out. A lot can go wrong, unfortunately. With cyclical matters, whether it’s commodity prices, other natural resources or exchange rates—a variety of issues can force cyclical influences on a company. Part of it is that companies tend to try to predict what’s going to happen with these commodity prices, when, in fact, oftentimes they’re really not predictable. And so part of it is not trying to predict the price, but more to be prepared for changes and fluctuations in the commodity cycle. So number one is to be prepared. I would say number two is, and this always happens in retrospect more than in advance, that coming out of a cycle, companies often look back at that cycle, whether it was a boom or a recession, and say, “Boy, I wish I’d managed that differently.” It’s quite common in a commodity business to come out of a growth cycle, and when a bust comes out of nowhere to say, “Wow, I think we emphasized growth too much. We should have been prepared for a downturn.” And likewise, during a recession, when things recover, they say, “Maybe we cut back too far, and maybe we didn’t invest in growth enough.” Those are the fundamental business principles that can often go wrong. There’s got to be that serious push-pull between knowing the short-term investor wants growth at all costs, so the board wants to incentivize for that, and the board also knows it should probably be looking at sustaining growth over the long term. How have you seen people manage this well and perhaps not so well when it comes to incentivizing leadership? The incentives can be a really important governor around managing both, and really anticipating both the growth times and the pull-back. And the incentives can do that, because they communicate so well what’s important to a company. Also, whether it’s a short-term incentive or a long-term incentive, it’s always a good idea to maintain this balance between growth and returns in incentive programs, so that the incentives are not all about achieving growth or all about achieving returns. You’ve got to find the right balance between the two. What are some of the primary ways people can do that? Because as we all know, metrics govern everything. Whatever you set as your metrics, that’s what you end up getting. So, what are some of the ways this is managed well that you’ve seen? I think the primary way, and it’s fairly simple based on what we just discussed, is whether there is visible evidence of both the motivation and reward for growth and for maintaining returns across the incentive menu? Today, companies need to publish details about how these programs work in their proxy statements, and that includes the list of metrics in both short-term and long-term incentives. Both the people participating in those programs and investors outside the company want to be able to look at that menu and see, “Do I have a growth metric associated with that?” Income or some type of volume or production measure are classic growth metrics in an incentive plan. But, do I also see something that at least ties back to capital discipline or returns? Is there a governor in the incentive program that says it’s not growth at all costs, but we do want to maintain returns? For example, return on assets, return on equity, what have you, whatever is good to have somewhere else on the menu as a governor. That balance is probably the most important. Let’s say a company is not necessarily in a natural resources business, but it sees an up and down. What are some of the things you tell them straight away that they should be starting to get their heads around, and what are some of the takeaways you give them? What’s your advice on communicating this plan to the various constituencies and communities around the company? When a company comes to you, what do you start with, and what are you hoping to leave them with that can take them through this in both the ups and the downs? Well, I’d tell them, in addition to those financial or operating metrics we talked about, we think it’s really important to evaluate performance based on relative metrics to other companies facing similar situations. Today, the most prevalent long-term incentive metric is a comparison of relative total shareholder return between a company and its industry peers that presumably are similarly affected by the same kind of outside influences.